Marshall C. Watson, the lawyer at the head of one of Florida’s most notorious foreclosure mills, will soon surrender his law license and shut down his infamous law firm, reports the Palm Beach Post’s Kim Miller. The owner of the Fort Lauderdale-based Law Offices of Marshall C. Watson has agreed to plead guilty to offenses found during a Florida Bar investigation in what is believed to be the first disciplinary action taken by the regulatory group against a so-called foreclosure mill. Because Watson will agree to a suspension of more than 90 days, he must apply for reinstatement if he ever wants to practice law in Florida again. From a real-world standpoint, this means that Watson is unlikely to ever recover his license. Also, because a non-lawyer cannot own any part of a law firm or share in the profits of a law firm, the Watson firm will have to shut down unless he takes his name off the firm and sells all his interest in the firm before the suspension takes effect. 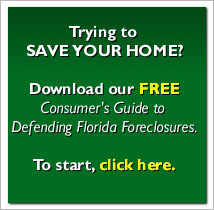 The Watson firm has previously paid a two-million dollar fine to settle a Florida attorney general’s investigation that the firm, among other things, falsified evidence presented to courts in foreclosure cases. The allegations led to the current disciplinary action involve a failure to train and supervise the firm’s employees in the performance of their duties—allegations that dovetail with the problems that led to the attorney general’s investigation.